Fr. Robert Barron, a priest born in Chicago 1959, wrote a book entitled “Thomas Aquinas: Spiritual Master.” I had the opportunity to read this book during times of adoration, traveling back and forth on a train and sitting near the pool-side. It is a light-weight and paradoxically a deep book. St. Thomas Aquinas has often been described as a cold systematic theologian, who describes the love of God in almost mathematical terms. Others have seen St. Thomas as a theologian attempting to capture the essence of God with words and philosophies. Against these numerous, yet popular claims, Fr. Robert Barron attempts to restore not only the supreme emphasis on the unexplainable, strangeness of God, but also the deep spiritual implications found in Aquinas’ theology. This book is fantastic because it covers very popular yet difficult questions with noble simplicity and common-sense. Fr. Robert Barron looks at “Jesus Christ: The Coming Together of Two Ecstasies,” the “Strangeness of God,” the “Creation: The nothing that is Everything,” and finally the “Human Being: Made for Ecstasy.” Underneath all of these chapters he constantly echoes the paradox of God’s mysteriousness, that while God is so far beyond what we can possibly grasp, he is also present to us in a more intimate way then we are present to ourselves. I highly recommend this book to just about anyone -- from non-philosophers to seasoned theologians. This book is an incredible aid to spiritual growth as it reminds us of the inescapable love of God. If I were qualified to make book reviews, I would give this the maximum amount of stars. 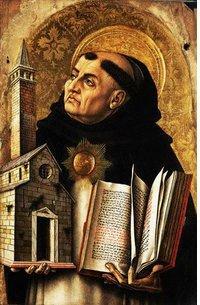 But because I am not, you will simply have to take my word that “Thomas Aquinas: Spiritual Master” will rock your socks!